Chichester Cinema at New Park, the city’s only independent cinema, celebrates its 40th Anniversary this year. 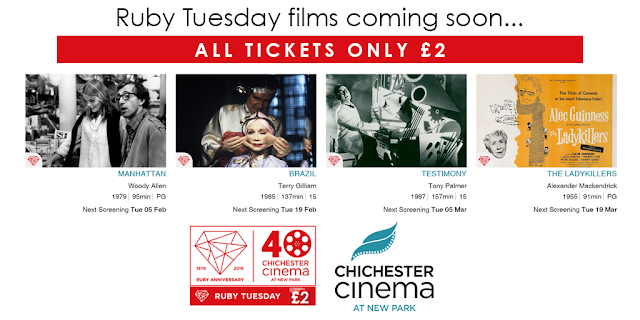 There are a lot of events to celebrate this milestone, including the introduction of Ruby Tuesdays; iconic films being shown from February to December on the first and last Tuesdays of each month, with tickets costing just £2. Ruby Tuesday kicks off on the 5th February with a showing of Manhattan, Woody Allen’s classic, starring Diane Keaton and Meryl Steep. Other Ruby Tuesday films include Brazil, starring Jonathan Pryce and Michael Palin, on the 19th of February, Testimony featuring Tony Palmer on the 5th March and the fabulous The Ladykillers with Alec Guinness, on the 19th March. There will be plenty of other events, themes and mini-seasons to mark this remarkable milestone created by Roger Gibson, the cinema’s President and Artistic Director of the Chichester International Film Festival. A magazine charting the cinema’s 40 years will be published in March, just in time for the Annual Film Quiz on the 16th March, which will focus on the cinema’s 40th Anniversary. You can pick up a copy of the current Awards Season brochure, which has details of current films from all over the world, including Mary Queen of Scots, Vice, Green Book, Burning (South Korea), Ralph Fiennes’ The White Crow and many more. Look out too for ballet, opera, theatre and art shows screened from London, Berlin, New York and elsewhere. The cinema attracts over 75,000 people through its doors each year at Chichester Cinema at New Park, New Park Road, Chichester, PO19 7XY. Their plush red seats are waiting for you and the café’s open before screenings.